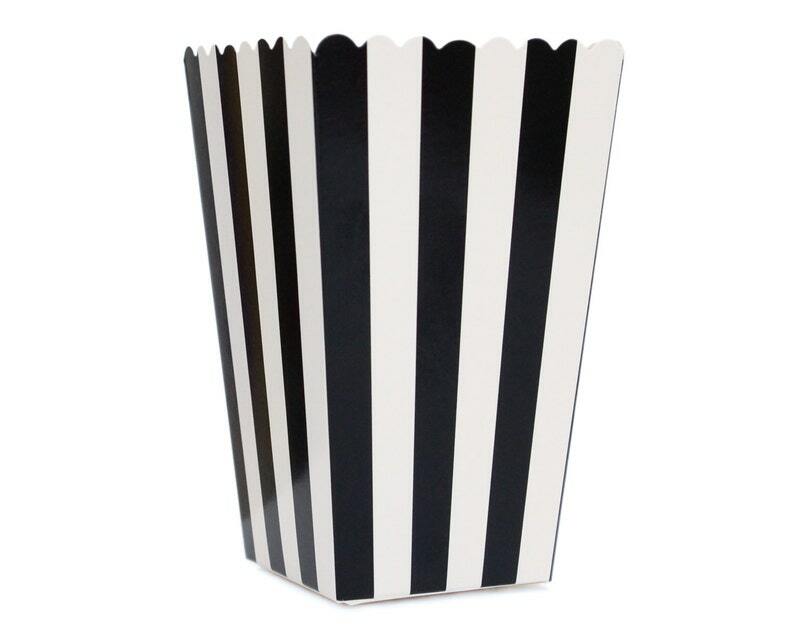 Popcorn Box / Scoop in a Black Striped Pattern. Size - Height: 4.5" Width:3"
Popcorn box is open on top and is great for just the right size servings. Use the drop down box to select the quantity of popcorn scoops you need. You can purchase popcorn boxes in quantities of 6, 12, 18, 24, 30 or 36 all for one low shipping price. Popcorn scoops are perfect for birthday parties, weddings, baby showers....any special event you can think of and these popcorn boxes would be great. We carry over 36 different colors and patterns of popcorn scoops in stripe, chevron and polka dot patterns. You are sure to find the perfect little containers at Eve's Party Market. Super cute small popcorn boxes that going to add detail to my candy table! Because of the way the bottom attaches the containers don't have a flat bottom. The boxes would easily fall over and spill. Fortunately, it was only popcorn but still messy.